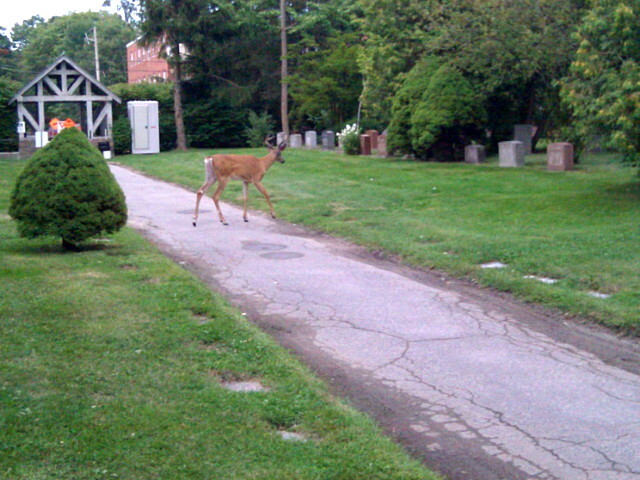 I frequently encounter joggers, walkers, cyclists, workers, rabbits, squirrels, and birds on my near-daily rides and walks through Mount Pleasant Cemetery, but this is the first time I’ve seen a deer. He was right near the Bayview entrance munching on some floral tributes before crossing the path to see what tasty treats await on the other side. I encounter deer often enough in the Don Valley that I’m not really surprised to see them in the city, but they usually bolt as soon as they see or hear you. This one walked almost straight toward me to get to the path—I moved twice to keep my distance—and didn’t seem fazed by any of the other people who passed no more than 15 metres away. Also, I’m going to start carrying a real camera with me again; this phone camera just doesn’t cut it.